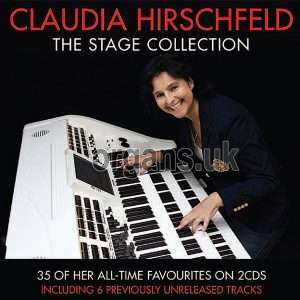 We now move to a double CD compilation of German organist Claudia Hirschfeld’s best tunes taken from SEVEN of her albums (thirty-five tracks in total). You may be sad to hear it’s not a brand new recording, but it does contain SIX unreleased tracks played on the Wersi Louvre. At the bargain price of just £6.95 and with over twenty-two minutes of new material, it does make it one of those Greatest Hits CDs that’s actually worth spending money on, even if you happen to have all her albums. It’s unusual as it’s not one of Claudia’s own releases, but has been produced and packaged by ‘Not Now Music,’ who have been the record company behind the four most recent Klaus Wunderlich CDs and also the “Organ Moods” set. Now I should come clean… as this is not officially released until November 10th (when this magazine is at the printers), I don’t actually have a copy of this one, just the graphics of the packaging and track details. However, as it’s nearing Christmas and this would make a cracking little stocking filler, I thought I would give you the details. The albums selected for inclusion range from 1999-2012 and are; Spectrum (1999), Blackpool Favourites (2002), Milestones (2003), The Wonder of Music (2004), Classicals (2009), Colours (2011) and Il Concerto (2012). All of these are played on various Wersi models, from the Spectra Golden Gate and Scala to the Louvre GS1000 and Abacus keyboard. The only exception are two tracks from ‘Colours’ which was Claudia’s only foray into Roland’s Atelier instruments and the AT-900c model. Having stocked all the CDs these tracks have been plucked from (bar the unreleased ones which look pretty interesting), I think the result will be a very enjoyable and popular release. Not Now Music do a great job on the packaging side of things too, so you will have a great looking end product with an outer sleeve and a nice informative booklet. I mentioned this double CD compilation by German organist Claudia Hirschfeld’s last issue. It wasn’t released at the time of review, but it is now, and it is a lovely produced set containing thirty-five tracks from seven of her recordings, plus six unreleased ones played on the Wersi Louvre. It’s worth noting that all the CDs these tracks have been taken from are now deleted, which make this set even more collectable. The tracks that have been selected cover a thirteen year output from 1999-2012, the CDs being: Spectrum (1999), Blackpool Favourites (2002), Milestones (2003), The Wonder of Music (2004), Classicals (2009), Colours (2011) and Il Concerto (2012). Most are played on various Wersi models, including the Spectra, Scala, Louvre, Abacus, with the addition of two tracks on the Roland Atelier AT-900c. This is certainly an eclectic mix, from slow classical/orchestral pieces to several pulsing Euro-trance numbers which are slightly more popular on the other side of the Channel (and possibly a more youthful audience). These pieces are fun and give variety to a set-list that stretches to two hours and twenty minutes! Claudia has several of her compositions on here too, which make up some of the album’s highlights. As I said last time, this is the latest organ release from the ‘Not Now Music’ label who have done such a great job on the recent double CD sets of Klaus Wunderlich and Organ Moods. FULL TRACKS: Disc One (Time 70:28): Toccata • Highland Cathedral • Young Opera • (I Do Like To Be) Beside the Seaside • Villamartin • Rock ’n’ Roll Medley • Brahms’ Lullaby • Caipirinha • Radetzky March • Nostradamus • Mission Impossible • Happy Radio • Ode to Joy • Music • Waltz No.2 * • Elvira Madigan * • You’ll Never Walk Alone * • Disc Two (Time 68:58): Contrasts • Eleni • Triumphal March • Dreams of Dubai • Moliendo Café • Chorus of the Hebrew Slaves • Colours • Queen of the Night • Hagia Sophia • Theme from Caravans • Tanzen Möcht’ Ich • Pie Jesu • Milestones • Das Boot • Time To Say Goodbye • Sabre Dance * • Ave Maria * • You Raise Me Up * (* Unreleased Bonus Tracks). This entry was posted in OKC Reviews and tagged cd, organ, review, wersi.